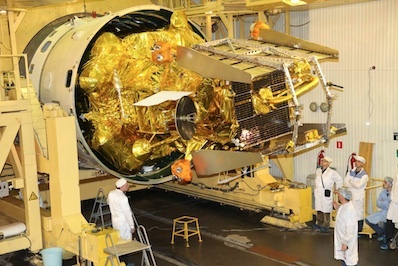 Russia's Phobos-Grunt mission, an audacious effort to retrieve samples from a Martian moon, is stranded in low Earth orbit following a successful liftoff Tuesday from Kazakhstan, according to Russian reports. Two rocket burns were supposed to propel the massive probe on a course toward Mars late Tuesday, but indications are the engine firings did not occur, according to Vladimir Popovkin, head of the Russian space agency. 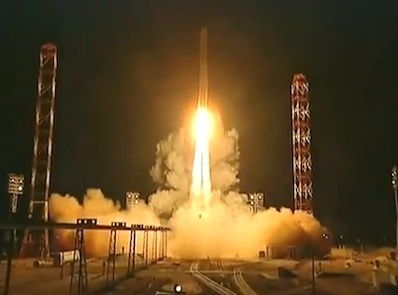 The revelation came after a successful blastoff on top of a Zenit 2FG rocket at 2016 GMT (3:16 p.m. EST). Phobos-Grunt and an attached rocket pack separated from the booster about 11 minutes later. Radar trackers did not detect Phobos-Grunt in the expected orbit after it was supposed to fire engines nearly three hours after liftoff. The burn was timed to occur over South America and out of range of Russian ground stations, which are limited in coverage over Europe and Asia. "We had a difficult night, and we could not locate the spacecraft for a long time," Popovkin said in a report by the Russian Novosti news agency. "We now have its position. It was found that the propulsion system failed. There was neither the first nor the second burn." Popovkin said the spacecraft may not have issued the command for a specially-designed rocket system to ignite, adding such an issue was foreseen during the development of the mission. He also suggested there could have been a problem with the craft's orientation and switching from sun-tracking to star-tracking, according to the Novosti report. A subsequent story in Novosti late Tuesday night said such a problem could be due to software or hardware issues. If it was a software glitch, the odds of recovery are good, while a hardware anomaly could have more dire consequences for the mission, the report said. A senior manager at NASA's Deep Space Network said there is no agreement between the United States and Russia for tracking of the launch sequence with the network's powerful communications antennas around the world. The antennas could be made available if Russia requests aid, the mananger said. Engineers are evaluating whether the spacecraft can be recovered in time to upload fresh commands to attempt more engine burns to aim for Mars. According to Popovkin, ground teams have three days to try to devise a new program for the burns toward Mars. Because it didn't fire its engines as scheduled Tuesday, Phobos-Grunt still has a full load of propellant to get to Mars if engineers can find the cause of the problem and fix it. In a report by the Interfax news agency, Popovkin said he would not describe the mission as a failure yet. After initially reaching an elliptical orbit a few hundred miles above Earth, Phobos-Grunt was supposed to fire its main propulsion unit twice, first to raise its altitude, then to inject itself on a trajectory to escape Earth. Neither burn occurred, meaning the spacecraft is probably still circling Earth at altitudes between 120 miles and 215 miles. The orbit was supposed to have an inclination angle of about 51.4 degrees to the equator. The first rocket firing was supposed to raise Phobos-Grunt's maximum altitude to more than 2,500 miles. A second burn would have accelerated the spacecraft beyond escape velocity, the relative speed needed to overcome the influence of Earth's gravity and head for Mars. Phobos-Grunt should have been on an Mars-bound trajectory at 0120 GMT (8:20 p.m. EST). The $163 million mission's propulsion system is derived from the Fregat upper stage, a hydrazine-fueled space tug that often places satellites in high-altitude orbits above Earth. The Fregat has never been used on an interplanetary mission before. The Fregat-based main propulsion unit was supposed to stay attached to Phobos-Grunt for course correct maneuvers and a critical braking burn to arrive in orbit around Mars in October 2012. After getting to Mars, the probe was supposed to jettison the propulsion unit and deploy China's Yinghuo 1 orbiter, which rides piggyback on Phobos-Grunt for the journey there. By early 2013, Phobos-Grunt was scheduled to approach Phobos and study the moon with remote sensing instruments, giving Russian scientists data needed to select a landing site. Using a laser altimeter and radar navigation sensor, Phobos-Grunt was expected to descend to the surface of the moon in February 2013. Because of the weak gravity field at Phobos, the probe must make a gentle landing with little margin for error. After scooping up rock with a robot arm and placing the samples in a canister, Phobos-Grunt's return capsule was designed to depart the moon and target a landing back on Earth in August 2014 with nearly a half-pound of soil. After sending its samples back to Earth, Phobos-Grunt's core spacecraft was supposed to remain on Phobos for a continued science mission for up to a year.